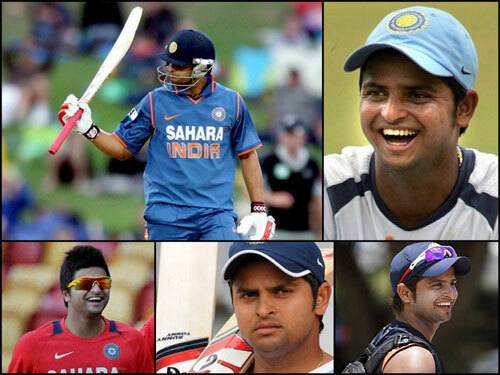 Suresh Kumar Raina (born 27 November 1986) is an Indian cricketer from Gaziabad, UttarPradesh. His family comes from a town of Rainawari, in Jammu & Kashmir. Raina has been a member of the Indian cricket team for ODIs since July 2008, and was included in the Test squad in early 2006, but did not make his debut until July 2010. Domestically, he plays for Uttar Pradesh in the Ranji Trophy and Central Zone in the Duleep Trophy. He is a left-handed batsman and an occasional off spinner. Suresh Raina comes from a wealthy business Kashmiri Pandit who have origins in the Rainawari quarter of Srinagar, a city in the Indian-administered Jammu & Kashmir. Raina decided to take up cricket seriously in 1999, and moved from his city Muradnagar, Ghaziabad, UP (near New Delhi) to Lucknow, the capital of Uttar Pradesh, to attend the specialist government Sports College. Raina is known for his aggressive batting who clears the field with swashbuckling flourish and is regarded as one of the most fearful batsmen when at top of his game.He is considered as one of India’s best fielders in the circle.However he has an iffy technique against the short ball and reverse swing which has got him out on several occasions very cheaply undermining his batting strength considerably. He was on the bench through the first half of the 2011 Cricket World Cup as captain Mahendra Singh Dhoni went with the in-form Yusuf Pathan. This remained so until the group game against West Indies, which he started due to an injury to Virender Sehwag. He started against defending champions Australia in the quarter-finals as Dhoni made a strategic change, omitting Yusuf Pathan in favour of Raina. Raina responded by assisting Yuvraj Singh in a successful run chase through high pressure, making 34 from 28 balls to carry India to victory. Suresh Raina was signed by the Chennai Super Kings for $650,000 for the first three years of the tournament. Raina made significant contributions in the first edition of the tournament to compensate the Chennai Super Kings over the losses of key players in Matthew Hayden,Michael Hussey and Jacob Oram.He played a vital MOTM performance in the last league fixture to give Chennai Super Kings the win they required to qualify for the semi-finals. Ultimately the Super Kings finished as the runners-up of the league with Raina scoring the most runs for them.